James David McGovern was born February 5, 1965 in Teaneck, He was the sixth of nine children. Jim and his brothers grew up in house just off the fourth green at the Hackensack Country Club in Oradell, where they grew up. They made a secret entrance through their backyard so that they could putt for quarters in the evenings after the course was clear. They also played baseball and football on the manicured fairways. Several of them would go on to win club titles, including Jim, who captured four. Ironically, Jim never took a golf lesson in his life. Jim’s younger brother, Robby, went on to play linebacker in the NFL. An older brother, Tom, would become head of the New Jersey State Golf Association. Jim played football, too. At 6–1 and 200+ pounds, he was a standout tight end for Bergen Catholic High School. Jim's mother was a diehard supporter of the football team, working games and raising money for the players. For sold-out games, she would often re-sell used tickets even though no seats were available to generate extra cash for the team. It didn't matter—fans were happy to stand along the sidelines. Jim was thinking about a football career until a bad knee ended any long-term prospects in the sport. Instead, he took up golf (the school’s football coach also coached the golf team) and was good enough to make the University of Arkansas team as a walk-on. John Daly was the star of the Razorbacks at the time. Jim was offered a full scholarship by Old Dominion and transferred there for his senior year. After winning the Virginia State Intercollegiate Championship, he decided to try to make a living at the game. In 1988, Jim won the Metropolitan Amateur Championship, the tri-state competition whose winners include George Burns and Walter Travis. He played three years on the PGA satellite circuit before qualifying as an alternate on the Hogan Tour—the PGA Tour’s top developmental circuit (now the Web.com Tour)—with three tournament victories in 1990. 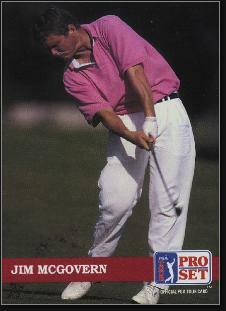 In 1991, Jim made the PGA Tour and made the cut in 14 of the 34 tournaments he entered as a rookie. He reached the peak of his game in 1993 and 1994. In 1993, Jim led the Los Angeles Open before fading late, and won the Houston Open in a playoff over John Huston in a weather-shortened event. He birdied the second sudden-death hole for the victory. It would be Jim’s only Tour win; he finished in the Top 30 in prize money for the year. In 1994, he made a great showing at the Masters, entering the final round just four strokes off the lead. He finished tied for fifth at –3 and pocketed over $70,000 in what he later called his proudest moment as a pro. Later that year he tied for 13th at the US Open. Jim was a Tour regular into the late-1990s, entering nearly 400 events and logging 14 Top 10 finishes. In 1995, however, with the pressures of a young family dividing his attention, he seemed to lose some of his passion for golf. He quit the Bay Hill Invitational in the middle of the second round and lost his tour card by the end of the decade. Jim became the club pro at White Beeches in Haworth in 2011 and continued to compete in regional tournaments. In 2013, Jim made a thrilling run at the NJSGA championship on his old home course, nailing four consecutive birdie putts for a final-round 68, but lost by a stroke. In 2014, he did well enough at the PGA Professional National Championships at Myrtle Beach to earn a slot in the US Open. He won the New Jersey Senior Open in 2015 and 2016, and also won the Metropolitan Senior Open in 2016. In 2018, Jim was inducted into the New Jersey Sportswriters Hall of Fame along with Carli Lloyd, Bruce Harper, Brad Brach, Frankie Edgar, Todd Frazier and 11 others. He also qualified for his third US Senior Open in four years in May. Earlier in 2018, Jim lost the Head Pro Championship in a playoff…to his brother, Dave, the pro at the Brooklake Country Club in Florham Park. Currently, Jim is the only club pro in New Jersey who has a PGA Tour victory under his belt.